Welcome! Welcome one and all, to my belated music awards! Every season, I load a new CD of anime music into my car, and my favorite full songs are the ones that make the cut. Unfortunately, a certain band released their music LATE, and it was going to be on this LIST, so that's why I'm so delayed here. Bear with me. 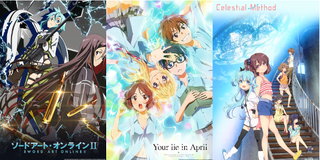 So, without further ado, I present to you the greatest music of the past three months in anime. Note: This list is, for obvious reasons, biased. Feel free to throw things at me after reading it, I survived Psycho-Pass 2's comments so I'm pretty confident I can survive anything. Note #2: I don't care whatsoever about the animation in the openings and endings, this is purely from a musical perspective, and takes into account the FULL SONG for each piece. Since Youtube doesn't always have this, I have included nightcores (changed pitch version of the same song) if they are good and a link to a safe mp3 for all songs. Why I Picked This One: This is just one of those almost senselessly catchy songs. It carries a really enjoyable beat throughout the entire piece, and even though there isn't really anything in particular that sticks out as impressive, I enjoy replaying it from time to time. Why I Picked This One: Kalafina manages to take an ending theme and somehow make it feel as epic as an opening theme. The initial buildup is quite entertaining, and the epic-ness continues throughout. However, I actually am not a huge fan of the singers' deeper voices, so it's tough for this to go much past the lower ranks of my list. Why I Picked This One: Whoever put these two bands together deserves an award. It was particularly interesting to have each of the singers switch in and out, so we could get to experience each vocalist's style repeatedly throughout this fast-paced song. Why I Picked This One: This song is actually an extremely catchy alternative rock song, but there is one big issue that I have with it: the lyrics. If you read the translation, they're about as messed up as the show they're from. Why I Picked This One: It was tough to place this song. Honestly, I really enjoyed the 'rewind' moments and the general originality, but it was really tough to put it any higher because it isn't something that I would replay more than a few times. Why I Picked This One: I know what you're thinking. Why is this so low? I really enjoyed this opening, and the music is fun to listen to. The problem, however, is the singer. Haruka (the voice actor for Asuna) does not really have a voice that is super appealing in a louder, faster-paced song. It worked for the first ending of the first season, but not so much this time. At least not for me. Why I Picked This One: Unlike some people, I actually really enjoyed this opening. The switch into waltz was pretty awesome, and the electric guitar/ violin duet during the bridge of the song is extremely cool. Why I Picked This One: This song is a surprisingly enjoyable rock tune. The slightly dissonant power chords are pretty fun to listen to, although I'm not a huge fan of the show itself. Why I Picked This One: This is pretty much a perfect ending theme for Parasyte. There's a tint of melancholy throughout the entire piece, and the focus on the vocalist (who is pretty damn good) over minimal instrumentation is a nice change of pace. Why I Picked This One: I really enjoyed the upbeat rhythm of this song. Everything about it felt like something I would hear at an actual theme park, and little touches like the clapping helped add to this effect. Why I Picked This One: Let Me Hear is one of the few autotune songs that I've actually gotten really in to. Although it's...hard to pick up, the words are actually in English in the beginning, and are extremely relevant to the show, and it the end is pretty fantastic, in my opinion. What hindered its position on the list, however, is the middle portion, which is a bit loopy. Why I Picked This One: The carefree tone of this piece, set up by the acoustic guitars and bells combined with the smooth lyrics of the singer, really make for good listening. Honestly, I'm holding onto this song for the spring because this embodies the season so well. Why I Picked This One: Konomi Suzuki is a fantastic singer, and Ginsen no Kaze manages to showcase this periodically throughout. My favorite part is when most of the instruments cut out and it's just her singing with a harp in the background, but the instrumentation in general is excellent, and simulates a battleground very well. The composer(s) knew how to use a snare drum! Why I Picked This One: I think that the part of the second season of Psycho-Pass that best captured the feeling of the original was the ending theme. Egoist's darker tone works well with this mixture of rock and electronic effects. Why I Picked This One: I really enjoyed Mashiro's voice, even though this is actually her first single. The piano hemiolas (when a rhythm is played in sequences that repeat faster than the measures) and violin counter melody are just two examples of the fun instrumentation present, and it is a combination of this and Mashiro that really bring this song this high on my list. Why I Picked This One: So it turns out LiSA is really good at making an ending theme. The slow piano accompaniment to her voice builds an excellent sorrowful feeling. I think the strong point of the piece, however, is the sudden transition to the much louder chorus. Even though it is louder, it actually feels more heartfelt and emotional than the slower portion, something extremely difficult to pull off. Why I Picked This One: IT'S AMAZING. Haven't heard it? Good thing you read this article, then. You're on your first step to recovery. All of the vocalists have wonderful voices that compliment each other perfectly, and the instrumentation is wonderful. Bells with trumpets? awesome. And make no mistake, this trumpet part is literally the GREATEST trumpet part I've heard that I can remember that wasn't some sort of march. Special thanks to Rockmandash12 for his help- finding those videos for me saved me SO MUCH TIME, you don't even want to know.